If you are at risk or have Type 2 diabetes, your diet is about to drastically change. For the better! The Type 2 diabetes diet focuses on getting out of the fast food and carbohydrate "rut." It focuses on introducing more whole and healthy foods that your body will need to manage this condition. Putting diet as a priority is the most significant thing in your treatment. It is important to come up with a sensible plan for eating to stabilize blood sugars and prevent complications from the disease. Read on to see how to work this diet into your lifestyle! When you start showing signs of Type 2 diabetes, you will need your doctor to send you to see a registered dietician to come up with a healthy eating plan. Often this can reduce symptoms of pre-diabetes or bring blood sugars under control if you already have diabetes. In Type 2 diabetes, excessive amounts of calories and fat intake can increase blood sugar levels. If this is not brought under control, you may experience severe complications and even long-term damage to the body's vital organs, nerves and blood vessels. The purpose of a Type 2 diabetes diet is eating the right foods to help keep your blood sugar levels stable, maintain a healthy weight and prevent long-term complications. It really is like the "Holy Grail" of diabetes! A recent diagnosis of Type 2 diabetes or if you have been told you are at risk for diabetes means you should see a registered dietician early in the game. They will help you compose a meal plan best suited to your needs; lifestyle, weight, and health goals. 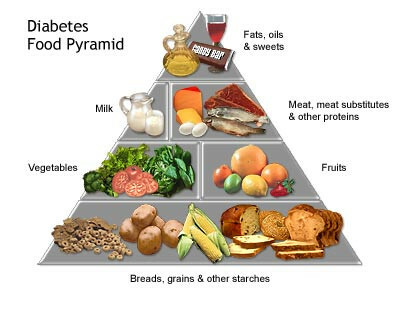 They know diabetes diets best and can give you needed information on how to eat healthy. Here are some of the guidelines for healthy eating with diabetes. Use your daily calorie allowance to get the best food possible. Fiber slows down digestion and the conversion of starches to glucose. High fiber foods are also good for the heart and help to maintain healthy blood sugar levels. These includenuts, beans, whole-wheat flour, wheat bran, fruits and vegetables that are high in fiber. Try to eat low-fat fish at least twice weekly. Tuna, cod and halibut are lower in fat and cholesterol than red meat and chicken. For an added benefit, eat fish high in Omega-3 fatty acids like salmon, mackerel and bluefish. This can further improve heart health. Avoid high mercury fish like swordfish, tilefish and king mackerel. Monounsaturated fats and polyunsaturated fats are good for lowering cholesterol. Eat modest amounts of avocado, pecans, almonds, walnuts, olive and olive oils but not too often because of the calories. These are just a few examples of diabetic friendly foods. Your dietician knows best and always consult your doctor before starting a new eating plan. Since diabetes puts you at higher risk for heart disease, you will want to keep your diet very heart friendly. Here are some foods you should try to avoid with diabetes. Try not to eat meat and dairy products that are high in these unhealthy fats. Avoid saturated fats like bacon, sausages, high-fat red meat and hot dogs. Stay away from Trans fats like stick margarine, shortening, commercial baked goods and processed snack foods. Limit these two fats to no more than 7% of your daily fats. Try to keep sodium intake to 2,300mg or less daily. Cholesterol is found in high-fat foods from animal products, egg yolks, liver, shellfish and organ meat. Try to keep your cholesterol intake up to 300mg daily. When it comes to carbohydrates, anything made from white flour, white rice, and white flesh potatoes are simple carbohydrates and tend to spike the blood sugar the most. Aim for wheat flour, brown rice and sweet potatoes. Sweet potatoes are very high in fiber. Eat only sparing amounts of cookies, cakes, ice cream or candy a few times a week. If you find something affects your blood sugar adversely, probably a good idea is to avoid it altogether. Nobody wants to count calories, but with diabetes it is a must-do! It doesn't have to be hard or take a lot of your time, so here is a calorie guideline. This range is for small statured women or women who would like to lose weight,and for medium statured women who do not exercise. This range is helpful for larger women who would like to lose weight. This is the calorie range for small men of healthy weight and size or men of medium stature who do not exercise. It is also a good range for medium or larger size men who would like to lose weight. This is the acceptable range for medium to large men who exercise. It is also a good range for larger sized men and women who do exercise regularly. The glycemic index is a new popular way to plan your diabetic diet. If the foods are registered high on the glycemic index, they are more likely to cause blood sugar spikes. If they are low in the glycemic index, they are less likely to spike blood sugar. This can really help with planning meals and knowing what you should eat more or less.